Our little ones are very precious to us and we want the best for them. Even though diaper changing is not our favorite task it has to be done. When it’s time for a diaper change, we want our babies to be comfortable.We also want to lay them in a clean space. That’s where a changing pad comes in handy. A changing pad is a vital piece of equipment because every baby requires regular diaper changes. With so many available, choosing the right one can be hard. We want a changing pad that is comfortable for baby, yet strong and durable. We also want one that is easy to clean, because—as all parents know—accidents will happen. We’ve looked at what is available and have come up with this list of the best changing pads in 2019. This changing pad has been designed to fit regular size changing tables. The pad comes complete with safety straps so you can secure the pad to the table. When making a diaper change there is a safety harness for the baby, which has a quick release buckle. The base also has a non-slip finish to prevent the pad slipping; we know all too well how babies wriggle and roll. These are all great safety features to keep our little ones safe when refreshing those diapers. The cover is made from a waterproof vinyl which is stain resistant. The pad is designed for easy cleaning. Any accidents can be dealt with quickly and simply, using soapy water. This makes it easy to keep your changing pad in perfect condition. The internal padding of the changing pad is made from soft foam. The two long sides are four inches high, preventing baby from rolling off. The overall size of the pad is 30 inches by 16 inches and this pad falls in the mid price range. As a mom or dad, your role can be challenging and hard work at times. When you have a small baby, a trip away from home can feel daunting. There is a mountain of items you need to take with you, as well as the baby and the stroller. Inevitably, there will be a diaper change needed while you’re out so what will you do about a changing pad? You could use one of the pads in a public restroom, but who else has used the pad and when was it last cleaned and sterilized? What germs are lurking on the surface? In this case, what’s better than a portable changing pad? 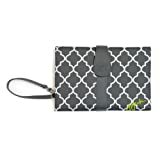 This changing clutch is perfect for those diaper changes away from home. It’s a compact clutch, so no big bulky pad to carry around. The clutch has a side pocket to store wipes and diapers, and the mat opens up to 28 inches by 19 inches. The compact design will allow you to toss it in the diaper bag or clip the clutch to your stroller. You have two great looking designs to choose from, and the price is mid range so will not break the bank. 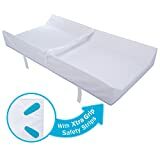 PooPoose Wiggle Free Diaper Changing Pad/ Changing Table Pad, White, 16" X 32" X 3.5"
This is a great changing pad for parents who are worried about their little one’s safety and cleanliness. Changing a diaper on top of a changing table can be a frightening experience if your baby is a wiggler. This is a perfect choice to help ease those worries and get on with the task. The pad comes complete with a thick strap to swaddle your baby and keep him/her safe. Designed to keep baby calm and relaxed during a diaper change, the strap is soft and adjustable. It will not leave any marks on baby’s body or causing any distress. You can remove and wash the strap with ease to keep it clean. Something worth noting is that this pad is more suited to newborns—older babies and toddlers may be able to break free of the velcro strap. The sides of the pad are contoured, giving extra peace of mind as the baby is less likely to roll off. The pad measures 16 inches by 32 inches and the contoured sides are 3.5 inches high. PooPoose has a wipe clean cover which is soft and comfortable, so there is no need for a towel or additional cover. The price of this is high end, but worth the money for its safety and comfort features. Some of us don’t have the budget or space for a changing table and this changing pad is ideal for that situation. The summer changing pad is in the mid price range and has some excellent features. The pad is designed with four sides. It will keep your baby safely in place, whether used on the floor or on a higher surface. It has double layered cushioning and is made from easy clean fabric, so is both durable and hygienic. It has both a safety strap for the baby and an anchoring strap to secure the pad to a table. The measurements are 32 inches by 16 inches and the depth of the sides is 4 inches. This pad does come with a couple of negatives that we need to point out. 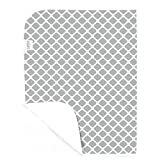 It has decorative perforations which can prove difficult to keep clean. The other downside is that due to the pad having four sides it may be hard to find a cover to fit. This means regular cleaning of the pad itself will be essential. LA Baby 30" 4 sided Cocoon style changing pad has 4" high sides to keep baby safe. Quilted outer cover is waterproof, anti-microbial, phthalate free, non-toxic, non-allergenic, stain resistant and easy to keep clean with mild soap and water Safety harness for baby with a quick release buckle. Includes security strap for holding changing pad to changing table or dresser top. This is another great changing pad for those with limited space who don’t have a changing table. It can be attached to a dresser with the safety straps. To keep the pad secure, the base is made of a non-slip material to prevent movement. The outer cover is quilted and waterproof as well as stain resistant. It’s made from anti-microbial fabric, and is easy to clean with soap and water. The cocoon includes safety straps for added baby safety. It’s important to note that the straps cannot be removed for washing; they will need to be wiped clean after use. The measurements are 30 inches by 16 inches and the sides are 4 inches high. Regular changing pad covers can be used to fit the cocoon pad. It is easy to store away after use and is in the mid price range. This changing pad is larger than most others. It measures 33 inches in length by 16 inches wide, and has a depth of 6 inches. The pad can be secured to a dresser or changing table with the included safety straps. The Colgate changing pad is in the higher price range. However, in addition to the longer length, the pad has some other great features too. It has a waterproof hypoallergenic quilted cover, is easy to clean and has the bonus of being tear resistant. The high contoured sides and safety strap will protect the baby from rolling off the mat. Thick and durable, this changing pad will ensure baby doesn’t feel any hard surfaces beneath. The Munchkin changing pad measures 31 inches by 16 inch and is in the mid price range. The pad will comfortably fit most changing tables or it can be used on a dresser. Munchkin includes some excellent safety features. The changing pad comes with straps which secure to the surface, and the base has grip strips. These strips provide added safety so the pad won’t slip when changing diapers. The sides are contoured so baby can’t roll off and there is also a safety strap, handy to secure a fidgety toddler who doesn’t want to lie still. The pad is lightweight and is made from wipe clean material, so it’s easy to maintain hygiene. Most changing pad covers will fit perfectly, so you can choose a cover and customize the pad to match the decor of the nursery. Make trips away from home hassle-free with this portable diaper changing station. Not only does this pad have a great stylish appearance but is also a really practical piece of equipment. It falls towards the higher end of the price range, but is well worth it. You can carry the changing station with ease using the strap, or clip it to a stroller. 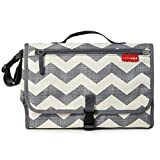 There is no need for an extra diaper bag as this one has you covered. It is actually not only a changing pad. It has enough room to store extra diapers in the mesh pocket, and comes with a hard case for wipes. The pocket also has enough space for extras such as creams. On the front is an additional zippered pocket, ideal for your cell phone or keys. 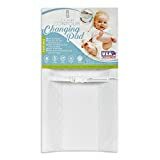 The changing pad itself is great for diaper changes. The head area is cushioned to give your baby extra comfort. The pad is waterproof and easy to clean. Be aware, however, that the changing pad can be slippery on some surfaces, due to the waterproof fabric. When open, the pad measures 23.5 inches by 21.75 inches. The closed bag measures just 11.75 inches by 8.25 inches. It’s an ideal size for carrying around and perfect for diaper changes anywhere. Some people prefer not to use the thick and bulky foam changing pads, opting more for the thin washable style. Ideal for use at home or when traveling, this changing pad from Kushies works well and is perfect for those on a tight budget. It is available in a selection of colors and designs so it will be easy to find one that you like. It’s perfect to use when changing diapers on the carpet, couch or bed and will provide comfort and protection for the baby and the surface. Made from soft material with a waterproof backing, the Kushies pads are easy to wash when accidents happen. The size is great too. With a generous 20 inches by 30 inches, you will have ample room when on diaper duty. This changing pad comes with a high end price tag but includes some great comfort features that make it well worth the extra cost. Comfort features include a layer of gel to keep baby cool, and memory foam. Complete with a luxuriously soft cover which is machine washable, baby will be totally comfortable during diaper changes. The sides are contoured to prevent your baby from rolling, and the pad includes safety straps for extra security. The pad itself is easy to clean by wiping it down, and replacement covers can be bought if needed. 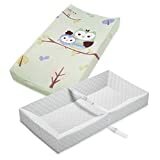 This changing pad is designed to fit most changing tables and measures 32 inches by 16 inches.The contoured sides are 3.5 inches high. If you don’t have a changing table, the pad will fit perfectly on a dresser. You can even use it on your bed or carpet. Portable and lightweight, this changing pad will store away when not in use. The comfort and safety of their precious baby or toddler is always paramount to a parent. Diaper changes are an inevitable part of being a parent but are not always the best of experiences. It’s no secret that diaper changes can be difficult. With baby rolling and wriggling, particularly as they grow into toddlers, these times occasionally become stressful. 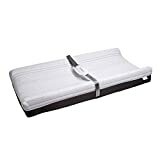 The use of a good quality changing pad with great features will not only keep your baby comfortable and safe, but also provide you with peace of mind while you get the job done. Less mess and a quicker diaper change will keep everyone smiling and happy. Choosing the right changing pad is an important decision. We made this list of the best changing pads in 2019 to help you find the right one. You can buy changing pads to suit all budgets and lifestyles. Whether home or away, there is sure to be one here that is a perfect match for you and your baby.